Whether or not you are a gun aficionado, you almost certainly have heard of the legendary 30-30 Winchester. 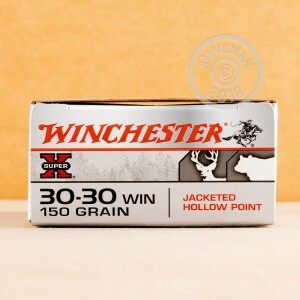 Introduced in 1895, the 30-30 Winchester swept America and the world with its fantastic abilities as a smokeless powder cartridge. Now, the 30-30 is considered by many to be the entry level round to big game hunting and rounds are compared to this cartridge to see whether they are effective or not for taking down game such as deer and elk. Since 1866, Winchester has been manufacturing high quality firearms and ammunition. Whether you are looking to hunt, defend yourself, or do some range training, Winchester has the ammo for you. These Super-X cartridges are perfect for you next hunting trip. 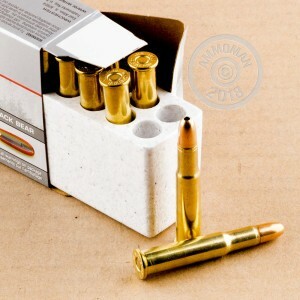 Each round in this box of 20 features a 150 grain jacketed hollow point projectile that delivers controlled expansion and consistent penetration. These Super-X rounds are what you need to knock down the deer of a lifetime. Stock up and save on the shipping. At AmmoMan.com any order over $99 will ship for FREE!